Today’s post is the first in what I hope will be a series of quarterly net worth reports. I love seeing actual numbers from everyone in the personal finance community, so I thought I’d join the party and share my own numbers as well! It’s my hope that you find this report helpful as you continue on your own financial journey. Before continuing on, I’d like to lay out some background about the numbers I’ve shared below. First, I’ve only calculated my own individual net worth. The spreadsheet below doesn’t include Ms. FP’s assets or liabilities simply because we aren’t married yet and haven’t technically combined our finances. Once we’re married next year, I’ll probably update these net worth reports to include both of our assets and liabilities. Second, I’ve rounded these numbers to the nearest dollar. I initially tried calculating my net worth down to the penny, but it looked a bit too cluttered for my taste with all those decimal points. As shown in the spreadsheet, my current net worth as of this post is $61,526. I wish it were higher. As most of you know, I graduated law school with $87,000 in student loan debt back in 2013 and started out with a negative net worth, so getting into solid positive territory feels pretty good. Below are further details on these numbers. I actually have more cash than is currently listed, but for purposes of calculating my net worth, I’m only including cash that’s earmarked specifically for my emergency fund or as income from my side hustles. I try to keep around $500 to $1,000 in my regular checking account as a buffer. Since my checking account can fluctuate depending on the day of the week, I don’t like to count that in my net worth. The remainder of my cash is stored in either Capital One 360, Digit, or Qapital. I use the money in these accounts for planned expenses, such as vacations or Christmas gifts. Since I’m likely to spend this money, I don’t like to count these as part of my net worth either. At present, my emergency fund holds about 3 months worth of living expenses. I’m aiming to get this number up to around $10,000-$15,000. For now, I think I have enough to cover me for a decent chunk of time in the event of a job loss. And, I think if a really big emergency came up, I should be able to bridge the gap through side hustles, or worst case scenario, pulling money from my Roth IRA contributions. I can also pull money from other cash funds (such as my vacation fund) if necessary. I’m also not too worried about keeping some cash on hand because most of my emergency fund savings are earning 5% interest in an FDIC insured bank account. 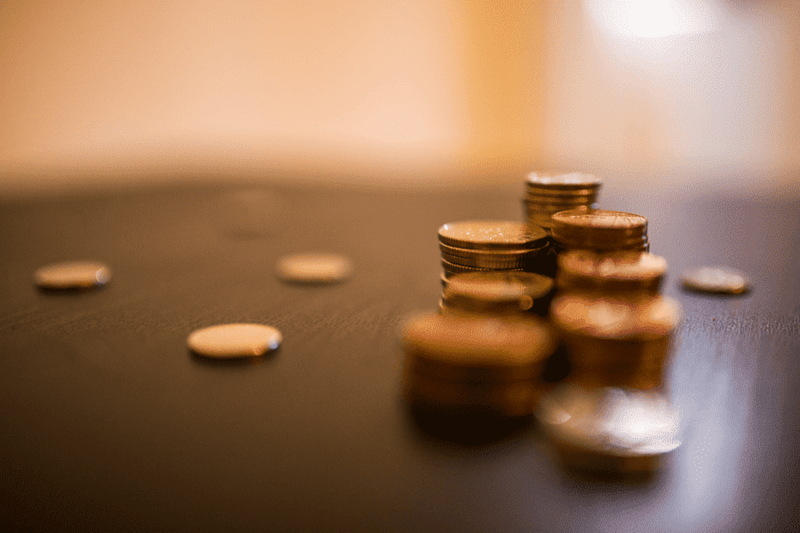 Contrary to what most people think, your emergency fund doesn’t have to earn crap interest! You can still get a decent guaranteed return using “mega high-interest” bank accounts. These are typically accounts that require you to meet some sort of usage requirements and require a little bit of legwork to set up. But once set up, the accounts run themselves. I store $5,000 of my emergency fund in FDIC insured bank accounts earning 5% interest. The remainder is kept in an Ally bank account earning 1% interest. I might do a post in the future explaining how to make use of some of these mega high-interest accounts. I keep my side hustle income in a Capital One 360 sub-account. The plan is to eventually move this money into a Solo 401(k). Note that I don’t spend any of this income, since I live perfectly fine off of my day job income. I’d also like to note that the side hustle income listed on the spreadsheet is lower than what I’ve actually earned this year from side hustling. I put a little over $1,000 of it into an HSA a few months ago and our Airbnb income is currently being deferred into 2017 for tax purposes. My plan with the Airbnb income is to fund as much of next year’s HSA as I can, and then keep the remainder to cover taxes and as an emergency fund earmarked for house maintenance. These are funds from the 401(k) that I had with my previous employer. The balance is made up of my contributions from 2014, 2015, and part of 2016. Unfortunately, my old law firm didn’t offer any matching, so the entire balance comes from my own contributions. I should note that I didn’t put as much into my 401(k) as I probably could have. In my first year out of law school, I knew absolutely nothing about how a 401(k) worked. My employer automatically had us contributing 5% of our salary to our 401(k), so that’s what I did. But, I smartly I used the remainder of my income to pay off my student loans as fast as I could. My overall plan is to roll my 401(k) funds into the 457(b) plan at my current employer. I just need to get around to filling out the appropriate rollover paperwork. I have my Roth IRA invested in a Betterment account with a 100% stock portfolio. I maxed out my Roth IRA in 2015 and am currently on pace to max it out for 2016 as well. Betterment has been fine for me so far. However, I might consider transferring the funds I have in Betterment directly to Vanguard in order to reduce my costs some more, especially since I now have enough to buy Vanguard Admiral Shares. I’m currently contributing 16% of my salary into a 457(b), which puts me on pace to contribute $12,000 per year to the 457(b). Once Ms. FP starts working, I plan to max this account out. The 457(b) plan I have is particularly good because it has access to low cost Vanguard funds, so I can keep my investing costs low. I also contribute 11.5% of my salary into a defined contribution pension. 5.5% of that comes from my salary and my employer throws in 6%. These contributions are invested in a total stock market fund. I didn’t have any employer contributions in my last job, so having my employer fund part of my retirement savings is pretty awesome. Having this pension is also great because it allows me to save even more of my income into tax-deferred accounts! In fact, even though I’m not maxing out my 457(b) yet, I am technically still on pace to save more than $18,000 per year in tax-deferred accounts. I jumped onto a high deductible health plan at the beginning of 2016, and with it, got access to an HSA. I use Fidelity as my HSA provider and invest the entirety of my HSA contributions into a total US stock market fund. You’ll also notice around $200 in employer contributions. As an interesting benefit, my employer contributes $500 per year to our HSAs. I opted not to use my employer’s HSA provider, however, because the investment options were pretty poor and had really high expense ratios. 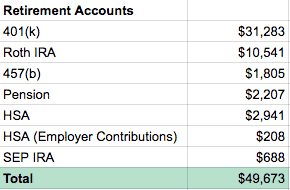 Unfortunately, my HSA employer contributions have to go into this specific HSA account. For now, I’ve just left the money in there sitting as cash. I’ll have to see if I can transfer that money to my Fidelity HSA. Last year, I made several thousand dollars in side hustle income. However, I didn’t realize that I could reduce my taxes some more by putting my side hustle income into an individual retirement account available for independent contractors. By the time I realized this strategy existed, the deadline to set up a Solo 401(k) had passed. My only option was to open up a SEP IRA, which I did around February of this year. My SEP IRA is currently held in Wealthfront and my plan is to roll this money over into a Solo 401(k) once I get that set up. Loyal3. I have a couple hundred dollars worth of play money that I invest into individual stocks using an app called Loyal3. The nice thing about Loyal3 is that it allows you to invest as little as $10 into a selection of individual stocks, with absolutely no fees. My rationale for using Loyal3 is to satisfy my individual stock picking itch and so that I can try my hand at stock picking without risking too much money. 529 Plan. I like to experiment with different types of accounts, so I set up a 529 plan in my own name about a year ago and contribute $25 per month to it. I chose to use the New York 529 Plan since my state doesn’t offer a tax deduction for 529 contributions and the New York plan has Vanguard funds and low expense ratios. It’s been helpful for me to figure out how 529 plans work before I have kids. Once I have kids, I’ll transfer this account over to their name. And that concludes this quarterly net worth report! It’s nice to see my net worth slowly increasing. 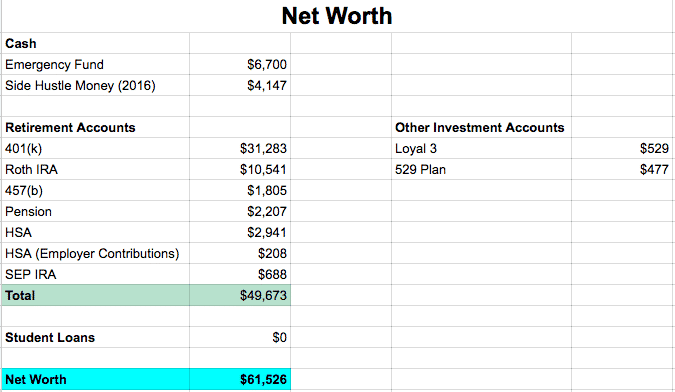 3 years ago, I had a negative net worth and knew very little about how to handle my finances. Now, here I am 3 years later, with my student loans gone, and a steadily rising net worth! Hoping to get to that six figure mark one day! This graph isn’t entirely accurate, but it does give you a sense of how my net worth has continued to go up over the past two years. I’ll be back next quarter with another net worth report! Hope you enjoyed this glimpse into my financial life. Congrats on making so much progress! Looks like things will start to move really fast from here. I definitely hope so! Sometimes I look at my investment account and realize I could easily have six figures in them if I didn’t put my money into student loans. But then I see that $0 next to my student loans and I feel a lot better. Congrats! Keep on trucking along. Things can only pick up the more you keep stuffing away and like you said three years ago you had a negative net worth so I think it is pretty impressive! Thanks Stefan! When you put it that way, it does seem better! I’ll just keep doing what I do and hopefully will see that net worth continue to rise. Congratulations in your progress! I think we’ll see a six figure net worth next year. I also like your thoughts about side hustle income. It clearly shows that a little extra income can add up to a big difference over time. Thanks Roadrunner! Not quite sure if I’ll get to six figures, but I suppose it depends on where the market turns! Either way, I still have a long road to go, so I’m just saving as much as I can and sticking to my plan. Where are you getting a 5% return on a savings account?? That’s impressive. Hi DS. I’m snagging that 5% interest savings account from the savings account that is attached to a NetSpend prepaid debit card. The only thing with these accounts is you have to be very careful in order to avoid getting his with any fees. Stay tuned for a future post where I try to explain these accounts. Congrats on the net worth! And thanks for sharing! You’re way ahead of where I was at your age. Curious as to where you’re getting the 5% interest on that $5000 in your emergency fund? We have Ally at .95% right now, but would love to cash in on 5%! Thanks Amanda! I’m getting the 5% interest using NetSpend prepaid debit cards. These are normally horrible cards that are riddled with fees and are aimed at taking advantage of the poor and the un-banked. I first learned about them through Doctor of Credit, which is basically a website for the “churning” community. Each of these cards come with an FDIC insured savings account which gets 5% interest on the first $1,000 in there. You can open up 5 total accounts for each individual. So if you’re a household with two adults, you can open up ten total accounts and put away $10,000. The churning community has been using these as savings accounts for quite some time. The crazy thing is, each account used to give you 5% interest on up to $5,000, so each individual could put away $25k at 5% (or $50k for a household). I guess they figured out that people were using these cards only for the savings account and dropped the amount because of it, which makes their usefulness much less now. As a caveat, I had these set up back when it gave 5% interest on up to $5k, so at the time, it was worth my time to learn how to use these accounts and to set them all up. The decreased amount now makes me wonder whether its worthwhile for the average person. Also, if you’re thinking about using these accounts, please do a lot of research first. If it’s helpful, I might write up a post on how these accounts work in the future, walking through the process step by step so that you can automate it all and avoid any fees. You definitely don’t want to jump headfirst into these 5% savings accounts just \there are a lot of fees if you don’t do it right. But, once you understand how they work, they really run themselves and are easy to use. Very interesting. Hadn’t heard about these, but a 5% yield in today’s economic environment (sans risk) is killer. I’d be all for reading a post from you about this in the future! It definitely seems like folks are interested, so I’ll try to put something together. Fair warning, it does take a bit of work to set up, but once set up, everything runs itself. With all your side hustle income, and no debt, that money will start to snowball on you fast. Nice job! Thanks Mr. Crazy Kicks. I’m working on that snowball! Nice breakdown of your net worth. Yes, it is nice to see the $0 student debt. You have done an awesome job – keep it going! Thanks Michael! I appreciate the link to your post. Could I ask why New York’s 529 plan isn’t included in your list of top 529 plans? I ended up choosing NY’s plan because it had Vanguard funds with an expense ratio of 0.16%. (16 basis points). There are no annual account or maintenance fees as well, according to the FAQ on the NY 529 plan website. I’ve got my 529 contributions invested in an “aggressive portfolio” which is 70% total US market fund and 30% total international fund. With a 0.16% expense ratio and no annual fee, it seems like it’s a really good option for folks who live in a state without an income tax deduction for 529 contributions. Morningstar evaluates each of the 50 states’ 529 college savings plan and provides a gold, silver, and bronze rating. It looks at five pillars – Process, People, Parent, Price, and Performance. My blog post covered the top four 529 plans that received a gold star rating from Morningstar in 2015. For a 2013 law grad, this is pretty phenomenal. Many of your peers haven’t hit net worth zero yet. Curious as to why you’re choosing to max out Roth IRA over fully maxing out the 457(b) and then putting whatever is left into the Roth IRA. What’s the thinking there? I’ll be honest…there isn’t really any thinking going on there, and it’s probably a good idea for me to reassess. Here’s basically how this ended up happening. In 2014, I didn’t know anything about investing or retirement planning. My firm had a default contribution rate of 5% into our 401(k), so I did that without thinking about it and had no idea where my money was going. In 2015, I upped my 401(k) contribution to 10%, while I continued to aggressively pay off student loans. In April 2015, I learned about Betterment from an ad I heard on a podcast. Betterment aggressively advertises all over the place, and since I was interested in FinTech, I thought I’d give it a shot and see what it was all about. I decided to just start up a Roth IRA with Betterment and contributed the minimum amount to my Betterment account – $100 per month. When 2016 came along, I set up my 401k contributions to put me on pace to max it out by the end of the year. Since I wanted to get all the tax advantaged savings I could, I also decided to go ahead and max out my Roth IRA. Since I hadn’t maxed out my Roth IRA in 2015, I first maxed that account out before the April 2016 tax deadline. After maxing my Roth IRA out for 2015, I then decided to go ahead and set my automatic contributions to max out my Roth IRA for 2016 by December 31, 2016. (again, was looking to get as much tax-advantaged space as I could). I then switched jobs in June 2016, and with it, I took a pretty big paycut and no longer had a 401(k). During this time, I just never changed my Roth IRA contributions, so it’s been pulling the same amount as I had set up back in April of this year. In short, it’s because I wasn’t really thinking and had just left things as it was from the beginning of the year. In retrospect, as I think about it, you’re most likely right. I should probably reduce the Roth IRA contributions to nothing for the rest of this year and put that entire amount into my 457(b), then go back to the Roth next year when I’m married and our overall income will be pretty low (since Ms. FP will still be in residency earning nothing and we’ll be a one income household). This is why I love the blogosphere. It’s a good way to see our blind spots, because honestly, I wasn’t seeing it all for some reason. Can you think of any reason for why I’d want to keep the status quo? I love reading net worth reports. I want you to do well and hope you get to six-seven figures but its nice to see someone starting out as well. Sometimes I read the six-seven figure reports and they’re so astronomical, it can get a little overwhelming. So true! A lot of people start their blogs when their already about to be at financial independence, so you see these giant net worth reports that seem so far away for most of us. But yep, gotta start somewhere! Loving the in-depth net worth report. You’re doing extremely well, especially considering you only graduated 3 years ago (!!!) – keep it going! I also like to see that you have a 3-month emergency fund – this is something that some people neglect, but it can be a lifesaver if you lose your job. This happened to me a few months ago, and I can’t thank “past me” enough for saving enough for a sizeable emergency fund! Thanks Ricard! I’m working on building up a bit more cash savings, just in case. It’s hard to know how things will look in the future, so I think it always makes sense to keep some money on hand. Appreciate you stopping by! Doing good. Don’t let any setback set you back lol. Once you get that snowball rolling it keeps rolling. I look forward to seeing your progress. Thanks Doug! Definitely hoping to keep this snowball rolling. Nice work! Love seeing that $0 next to student loans! I contribute to my kids 529 via the NYS plan and I’m go glad that there are low cost Vanguard options. Luckily for me, I also get a tax deduction since I live in NY. I’m a big fan of that NY 529. It seems cost effective. You get that nice double benefit of the state tax deduction, so definitely makes sense for you to contribute to it. Nice! I’m always impressed by those people who were able to pay off 5 or 6 figure worth of debt and are now back to the positive. It’s only a matter of time before you will reach 6 figures in net worth. Smart thing to do with funding your HSA with your side income! I only learned of HSAs because of reading personal finance blogs and learned that my employer contributes $1000 to my plan if I do healthy activities throughout the year. That pays off all of my health insurance so I’m going to get on that. That’s great to hear that your employer throws in some cash to your HSA. Be sure to check out what sort of investment options are in the HSA provider your employer chooses. The options in my HSA were pretty terrible, so I ended up picking my own HSA provider. Pat yourself on the back. I’d say your net worth is pretty amazing. We all want more. But at 3-years in, your doing just fine. Look at that chart going up! Congrats! I can definitely relate to the feeling that you wish it were higher. Sometimes I feel bad having to start out in a huge hole (we had 89k of debt) when others get to start from zero. I’d be at a huge number (to me) if I didn’t have that! I think we have similar debt pay off stories! It stinks to start in the negative, but the good thing is, by paying off our loans, we learned a lot about living on less. I know it’ll serve us well in the future.